The Cape market has suffered due to the Atlantic holidays and weaker stems from Australia with short period fixing at $16,500/pdpr. The Cape market has improved following stronger Australia/China trading with 6 months rate fixing at $19,000/pdpr and 1 year at $19,500/pdpr. The Cape short period market has ticked up to around $19,000/pdpr levels. The Cape short period market has returned to $18,000/pdpr levels and touching $19,750/pdpr for 1 year. Capes rates rose for a second week off the back of a resurgent Australian coal market as Swissmarine and Rio Tinto took vessels in the market. Cape short rates pushed up to mid-$14,500/pdpr levels off the back of improved ECSA mineral loading. Cape rates remain down despite spot market improvements with 1 year trades around $18,000/pdpr. Weak rates continued on both the Cape spot and period markets with 6 month time charters achieving around $15,500/pdpr as the market continues to overly rely on the Australia-China route. Cape rates remain depressed with a slowdown in activity for the Australia/China route with short periods achieving $16,500/pdpr whilst reports of $18,000/pdpr for 12 months have been confirmed. 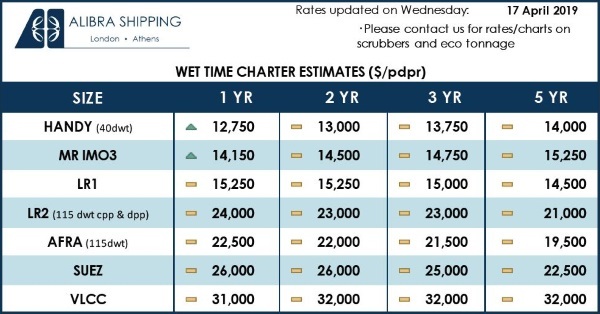 Cape short period rates in the Pacific are down $500 to $16500/pdpr as pressure on Australian single trips mounts given a surplus of vessels steaming toward the area. Owners remain bullish on the Panamax market in the East with rates of $15,000/pdpr being achieved for short period and $14,000/pdpr for 1 year. Cape 12 months can still achieve around $20,000/pdpr with expectations that the market will drop off mid-March. 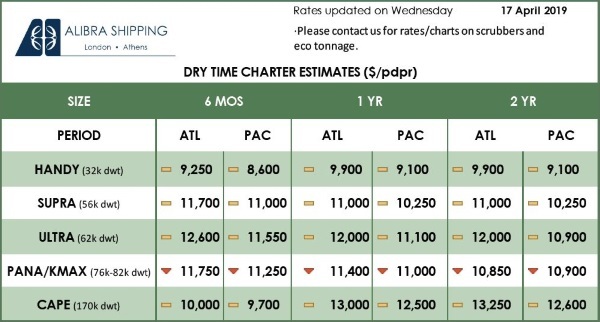 Panamax is mixed with rates from $12,000/pdpr up to $14,000/pdpr reported for short period in the East. Notwithstanding a quiet start to the week, the dry Owners have a few more smiles than our tanker friends. The Capemarket remains around $19,750/pdpr for 12 months with index fixtures reported for up to 20% of the BCI5.